Yum! Sonic is one of my FAVORITE places to freequent for s sweet treat. Kick of summer with a SPECIAL PROMO on Thursday, June 19th, Half Price Shakes ALL DAY! 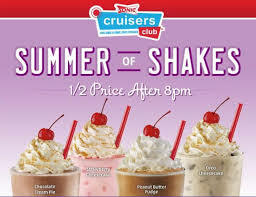 Don't worry if you can't make it on Thursday, the Summer of Shakes is back with 1/2 price nights. Every night after 8pm at Sonic, you can enjoy 1/2 price shakes. What's your FAVORITE flavor? Peanut Butter Chocolate ranks at the top of my list.